For the past 2 years I have been working with Francois Morelli, a multi-disciplinary Quebec artist. 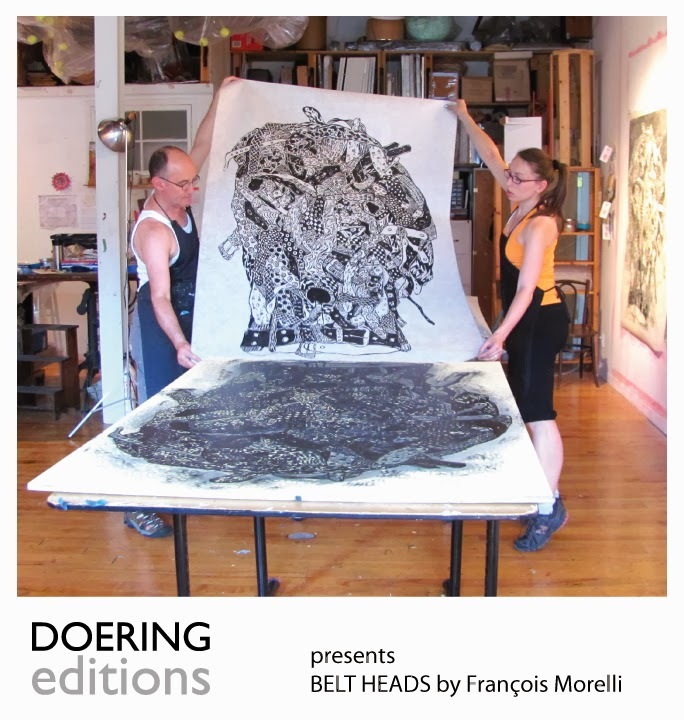 Francois created 4 large drawings on linoleum. We used flooring linoleum called Marmoleum, that I had worked with for my own linos in the past. I then carved the images for him. The tallest Linocut is 64" long. After I finished carving them we mounted them on wood and brought this project into its final stage during 2 weeks of printing in July. Since there is no press wide enough or long enough for most of these blocks in Montreal we decided to print them on beautiful rice paper by hand with a wooden spoon. Of course the sheer size of them creates many issues because pulling one proof all of a sudden can take up to 4 hours. Flexibility is definitely a necessity and we learned and adapted quickly. We tried different rollers, different ink consistency, different pressure, different spoons until we found a combinations that worked for us. And gave us the prints we liked. The first four days were proofing, the next 4 days were only printing. the last day was stacking, restacking and determining how many of these beauties we had in the edition in the end. The first proof we left the background in. We learned quickly that this was not the way Francois liked them. Additionally the rollers and the ink both got changed after this run. We turned Francois' studio into a printshop, with inking slabs and all. Pulling the very first proof on Newsprint. Almost looks like a pencil drawing, Francois' loves it. The relief printer thinks its a failed proof ;). And I did lots of ink consistency tests on one of my own little linos to avoid having to ink up and print of the huge ones just for tests. Carving away the background. The Grey marmoleum was a totally different consistency, the yellow stuff was MUCH easier to carve. Ink tests on my own linocut. GIANT PILE OF LINO SHAVINGS! Smaller Roller worked much better! Touch ups with a tiny roller. To fill in the porous texture of the Marmoleum. And now we print with the spoon, and that's how much the ink bled through on the back of the paper! Inked-up lino close up, carving these was so much fun! The first EXCELLENT PROOF!! It only took us 3.5h to print this! Don't worry a few days later it only took an hour and a half! Inspecting the detailed carving for the first time. :) Happy Customer! Francois' son Didier helped out for a few days, he carved and printed with us! He learned super fast and was a pro in no time! Inked block. (This 'little' guy was my favorite!) It only took me 45 minutes to print him in the end. We secured the paper on the block with pins to avoid any movement. The crowd. These are 3 of the 4 blocks, hanging out and waiting to be printed. Detailed carving on 'the little guy', after the first good proof of each block, we went in and touched up areas, on this one we found a big belt that didn't make sense and fixed the pattern. The wooden spoon started shrinking after a couple of days of 'spooning'/printing. When we really got going with the printing we finished between 4-5 prints a day. At one point Didier and Francois were printing together. Father and Son! What a project! And now the best part, after hours of physical labour, pulling the prints. First Peak. I don't have any good photos of each print yet. As soon as Francois' has them photographed I will post the results as well. This was an excellent and very rewarding experience (I have a huge biceps and triceps just from printing for 2 weeks, and that all without a gym membership! ;) And of course the prints, the work environment, experience and good company throughout the process was extremely rewarding! Francois already drew up a new lino so as soon as I am settled into my new studio in Halifax its time for major carving adventures again!